Oblivion has been around for so long now in one form or another. Electro (aka Electro69) took over hosting Oblivion in the fall of 2000 and its gone through countless changes since then. So many people were involved from the pre-Oblivion Epsilon Eridani Shard which grew from the Sentinal Heights (owned by Jack Frost) shard through the Run-UO based Oblivion we enjoy today. Oblivion first started as a Sphere shard, GM Iz was in charge of development and it made an incredible work along with GM Davros and GM Desslock. They were the ones that made Oblivion unique and one of the best shards around, both UO and Community-wise. The quests, the unique and rare items, fairs, the GMs and their Events and the consentual-pvp were the main things that attracted players to Oblivion. In mid 2004 Oblivion polymorphed into Oblivion Reloaded. This was the BIGGEST change in Oblivion history. The shard migrated from the outdated Sphere (mainly because sphere creators stopped updating the engine) to RunUO - the new generation of UO-emulators. Before the migration, a lot of work was done in order to assure all the unique characteristics of Oblivion would remain untouchable as well as the account data. Since one of the major issues with Sphere was the item count, a wipe was made leaving only accounts and character data (skills and stats). The process was tough, but thanks to Arael (also known as Juani) who was the Developer in charge of all the coding and migration, it took around 4 months to have Oblivion migrated to RunUO. 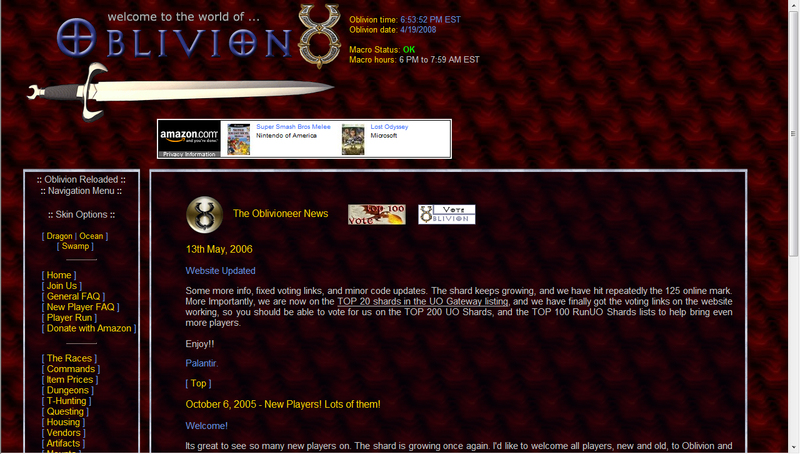 With this change, staff felt a new look for the website would be good, and Oblivion2.com got a face-lift with a nifty new website. Since then, with Arael in charge of development, Oblivion hasn't stopped growing. A lot of features were implemented and a ton of concepts and systems were adjusted to continue Oblivion's legacy and progress. Many have joined and many have left, but Oblivion is still leaves marks in UO shard history by being one of the oldest shards around. Multitudes have put their heart and soul into this dream we call Oblivion, so many that, to name some and not others would be immensely unfair. Suffice is to say that Oblivion has been influenced by all the staff and players who visit and have visited its lands. It is the unstoppable development, quests, adventures, rules, and often policing of the dedicated staffers that has set the precedents and tone for the shard which we now call home. It is because of this effort that many of us have settled down here and why we believe enough in the style of play and the population that we are willing to work to keep this shard alive. I was looking through some old emails ( I really should clean out my mail) and I found some of my original emails to a buddy about this really cool emulator I found for Ultima Online. Grayworld version 6.2. That server went live on October 18th 1998 and was on my ISDN connection. Nothing was populated, half the skills didn't exist, and more often than not a spawn point might generate a door hinge instead of the orc it was supposed to generate. Shortly after that, we moved the hosting to my friends house because he had a cable modem. Plus we upgraded to Grayworld 7. Woo hoo, now it would just crash instead of spawning a door hinge. Tanelorn ran for a year until hurricane Floyd completely flooded his basement and trashed the server in late 1999. But we persevered and Tanelorn the Phoenix rose from the ashes in early 2000. We upgraded to TUS (The Ultimate Server). Much more stable, better tools (anyone remember HOG? ), and a lot easier to manage. We'd have as many as 10 people on at most, but usually it was pretty dead except for gaming nights when we'd run each other in custom quests. Plus, I was able to push this server to my data center and put it on a Dual 450 Mhz machine. No lag. Then, late in 2000 Howlers told me that the owner of Sentinal Heights / Oblivion no longer wanted to host the game. Oblivion had a few more players, a fully populated world, and a husband/wife team of Admins (Neptune/Kutni) who were on almost all the time. Plus it was running on the latest version of emulators, this thing called Sphere. 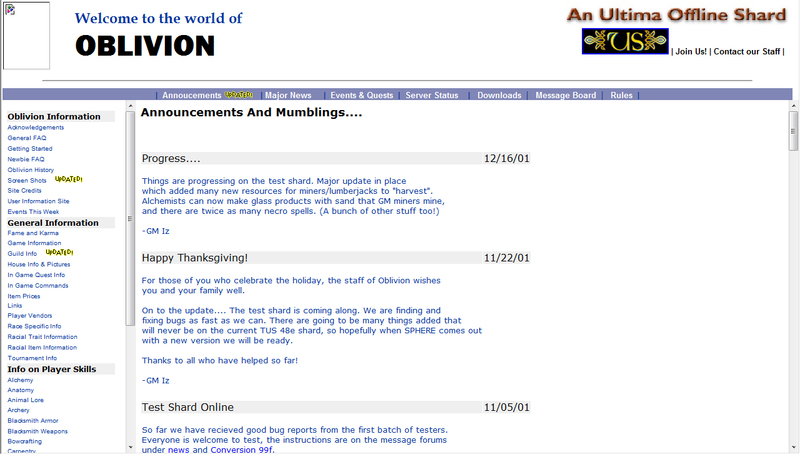 I went live with Oblivion on November 17th, 2000. I didn't really get a chance to play until about a week later. When I logged in, Neptune promptly jailed me because he knew everyone on the shard and thought I was was a hacker (he was right. )The rest is history. Anyways, 10 years later and I can't believe this is still running, and people are still playing.